If a “killer tomato” and a “chicken bus” collide, would it result in a chicken-tomato stew? These are names for the colorful buses of Guatemala. They careen around mountains in the countryside and through crowded streets in cities, but start their lives as mild mannered school buses in the United States or Canada. When school districts discard them, they are bought by enterprising entrepreneurs in Guatemala and other Central American countries. Buses painted a bright tomato red color, frequently with an armed guard to prevent robberies, stop every few blocks along city streets. Multicolored chicken buses, often transporting live animals, roam urban and rural roads. The buses start out in American school districts a school bus yellow. After years of transporting students they are retired, based on mileage or age. Then they may be used as spare buses until maintenance costs dictate they be sold. At that point a potential owner buys the bus at a bargain price with a certified check, money order or cash. He arranges for a Guatemalan driver to go north to Canada or the U.S. and get his prize. The driver’s pay is $1000, less expenses for lodging, food and gas during the two week trip. He joins the drivers of thousands of other used cars, trucks and buses taken down the PanAmerican Highway from Brownsville, Texas, through Mexico to Guatemala and points south. The new owner of a bus may pay from $5,000 to $10,000 to have the bus modified and painted. If it will be used on mountainous roads, it’s cut shorter, so as not to overturn on sharp curves. Seats that previously sat up to 78 students, are placed closer together with less padding to accommodate a maximum number of paying occupants. Manual transmissions replace automatic ones for greater control and better gas mileage. While the interior and the engine are being modified, the outside is painted with colorful, vibrant designs or tomato red. The bus is given a name that reflects it’s new personality. A bus route is applied for and a tax paid for the first year of operation. Two men partner in operating a bus: the driver, who hopefully has a driver’s license, and a helper who shouts out destinations, collects fares, sweeps passengers on and off and organizes luggage, livestock and produce inside and on the roof, often while the bus is in motion. The bus system in Guatemala is difficult to decipher; there may not be a system. Scores of independent companies serve most places anyone wants to go. There is an extensive network going to every town, village and tourist destination, but it is complex and decentralized with no plan as to where the bus terminals are located .Riders can’t predict where they’ll be let off or how safe an area will be. Compared with other modes of transportation, buses are inexpensive and therefore, crowded. The red city buses are temptingly cheap at 25 cents a ride, especially if you have to cross town. “Killer tomato” buses earned their reputation they are easy targets of extortion and violence by street gangs, organized crime and drug cartels so they are driven by aggressive operators at high speeds. There is no authorized public transportation system in many cities so the drivers often rent from a bus owner and receive subsidies from the government when they help provide transportation. This money and the cash from passengers makes them vulnerable to being robbed. Once extortion money is paid, the criminals often up the ante until it no longer pays to run the bus. The cost of hiring armed security guards makes a profit even less likely and doesn’t always discourage thefts. Justice has historically been weak to the point that the homicide rate in Guatemala is more than 48 per 100,000 inhabitants. (In Mexico it is 14; in the U.S. 5, per 2009 statistics.) 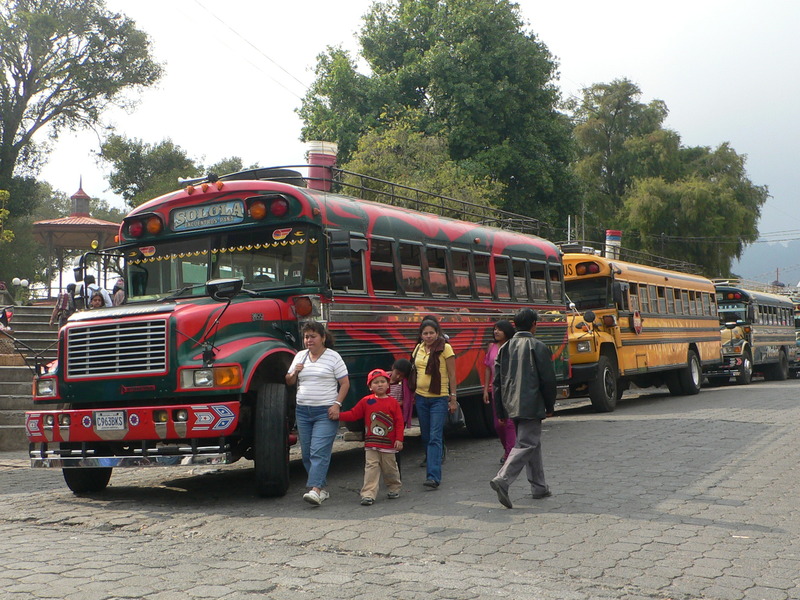 In 2010, 130 bus drivers and 53 bus helpers were murdered, according to El Periódico, the Guatemalan daily paper. On chicken buses there is little to fear except a bruised tailbone from bouncing over speed bumps at the entrance to each village. Occasionally, a zealot gets on for a few miles to loudly preach his religious dogma to the captive audience imprisoned like sardines in a can. He is soon replaced by Indian women dressed in blouses, skirts and head coverings of dizzying Mayan designs transporting their poultry and vegetables to and from the market. How many people can fit into a chicken bus? Always one more. And, when there is a collision, it is a colorful stew. Local footnote: Fremont Unified crushes its old buses because of an Air Quality Management Grant to get rid of diesel polluting vehicles. This has been done since 1996. Seventy-five per cent of FUSD buses run on compressed natural gas and twenty-five per cent on low sulfur diesel. 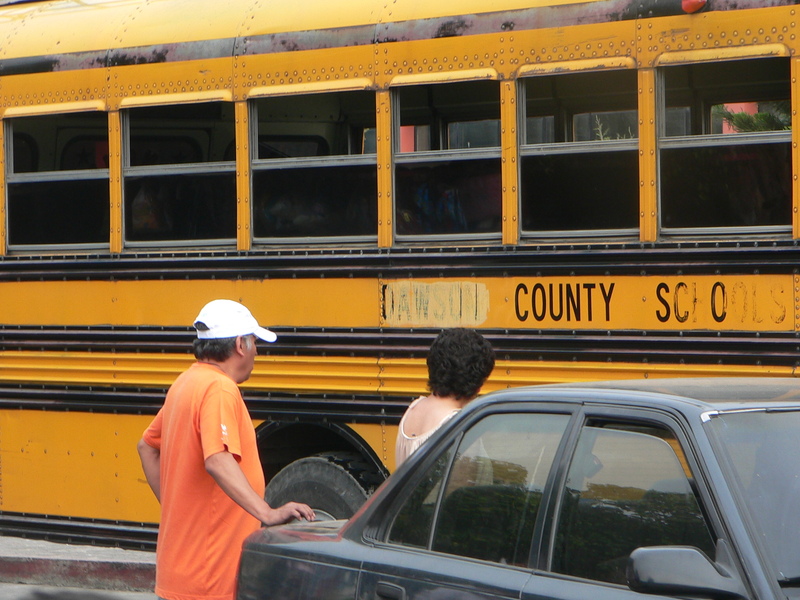 When school districts have to downsize they often auction off their buses. “Italian Cruise Ship with 4200 Aboard Capsizes off Italian Coast,” shouted the headlines on every TV, radio and newspaper on Saturday morning, January 14. Oh those poor people, I thought as I watched the first cell phone pictures of passengers, wrapped in beige blankets or orange life jackets, struggle to leave the sinking ship in the night. How frightening to be eating dinner and suddenly have your food slide to the floor because your ship is tipping over, I empathized, even though I’ve only been on a couple of cruises. Then came videos of the dark hallways crowded with masses waiting to exit. I could hear children crying in the background. No one on board, including the cowardly captain, seemed to know the extent of the danger they were in. So many, except the captain, were uncertain how to escape. As the day wore on, it appeared most everyone had abandoned ship by either jumping into the water, climbing down the ship’s tipping side or making it into a lifeboat. I was relieved for them, and the story began to move to the back of my mind. The next headline was “American Couple from Minnesota missing on Italian Cruise Liner.” Reports gave the number of Americans on the Costa Concordia, and said all but two had gotten off safely. Do they report that because American lives are more precious than any other nationality, I thought. The U.S. media always distinguishes between Americans and all others, as if there are only two types of people on earth: Americans and others less important. Is that a bias or feeding our public what it wants to know? On Sunday morning I was reading an e-mail from my cousin Jan in Minnesota when a photograph of her sister, Barbara Ann Heil and Barbara’s husband, Jerry, flashed across the TV screen. My God, that’s my first cousin they say is missing! My next thought was, What an awful photo of her. Couldn’t her children have found one that showed her with hair? Jan’s memo verified the report: my cousin Barbara and her husband were missing. The story immediately moved to the front of my mind and became personal. I needed to know everything. I googled “Italian cruise ship,” and read my cousin’s name on fifteen news stories. I wrote Jan to say I hoped they’d be found soon and offered her my limited knowledge of Italian. I felt helpless. I took out the photograph of barb’s fifteen young grandchildren she had mailed to me this past Christmas. She sent one of their smiling faces every year. She attended countless numbers of their communions, recitals, swim meets and soccer, baseball and basketball games. Who would take her place if she were gone forever, I worried. I posted one of the articles I found, onto my Facebook page. I desperately hoped someone might respond who had seen Barb and Jerry in a video or encountered them getting off the ship. Jan, who was now in Italy with Sarah and Jon, two of the Heil’s four children, immediately wrote asking me to take down the posting. They were trying to control media access to the family, which was extremely difficult and very stressful. My publicizing information wouldn’t help. I listened to a radio interview Sarah had given saying how her parents had worked hard all their lives to give their children private school educations all through college and just now were spending money on themselves. A family blog started on Tuesday, January 17. I went to it hourly hoping for good news. I kept imagining Barb and Jerry stuck in their cabin. A Korean couple was found stranded in their compartment, but there was no news about my cousin. Ironic, I thought, Barb and Jerry adopted a Korean orphan over thirty years ago, named her Sarah, and made her part of their family. Maybe they stayed on the ship because they couldn’t swim, or they helped others get to safety first. That would be so like them. All her life Barb had cared for others. She helped a son cope with Crohn’s disease, nursed her husband through serious back surgery and every day made food and delivered it to homeless shelters. These were just the challenges I knew about from her letters and Jan’s visits. She came through pancreatic cancer and a hip replacement; maybe she can survive crashing onto a rocky reef. Why do I mourn someone who’s not been a major part of my life since childhood? After my parents moved us to California when I was sixteen I saw Barb twice: once, on her way to teach native Alaskan children at a missionary school in the middle of northern Alaska (after three years of college), and again in 2005 when my husband and I visited her and her two sisters in Minnesota. The specter of death brings back wistful reflections of our childhoods together. Our fathers were brothers who visited one another with their families of same-aged girls every few months. We lived in eastern Montana and Uncle Joe lived on a farm in western North Dakota, three hours away. We would arrive at their farm and head for my cousins’ playhouse. For hours, we made green salads out of weeds and hamburgers out of thick grey North Dakota mud. We dressed our dolls in frocks we had sewn. Together, we rode their ponies, chased the sheep and gathered the eggs from the hen house. When it was time for real salad and hamburgers (products of their farm) we giggled at the picnic table in their tree-lined windbreak . After a dessert of homemade ice cream, it was time to head back to Montana in time to milk the cows. We always hated to leave. Two weeks after the Costa Concordia’s accident, e-mails from Jan have diminished. A more attractive photo was displayed on televison (thank heavens!). I saw Sarah and Jon on CBS in the prow of a boat placing daisies in the sea for their mother and white roses for their father. Hillary Clinton called Sarah with condolences. The Heil Family Update blog is the only news being quoted by the hungry media; it has moved on to more current disasters. Caring friends and relatives keep praying, but we now hope that the bodies of Barb and Jerry will soon be found so their children can bring them from Italy for services in Minnesota. I am left to contemplate death—and life: what it means to have lost someone I loved when a child but so seldom saw after; how different her life and faith were from mine; and how deep must her loss be to her children, young grandchildren and community. Most of all, I think of other deaths, my father’s, my brother’s and my own which somehow seems so much closer now. Everyone I have known is a part of me, maybe a tiny part, and their passing affects me. If we believe that we are all a part of the whole of humanity then everyone’s passing affects everyone else.